These Eggplant Fritters with Tomato Chutney are one of my favorite appetizer/dinner recipes. But I don’t make them very often since eggplant has such a short storage life. I can’t tell you the number of times I’ve bought eggplant and had to throw it out because I didn’t use it quickly enough. So, one of my goals this year was to reduce my food waste – which hasn’t been easy. I am always way too tempted by the beautiful produce at the farmer’s market and I haven’t quite adjusted to just cooking for two people. 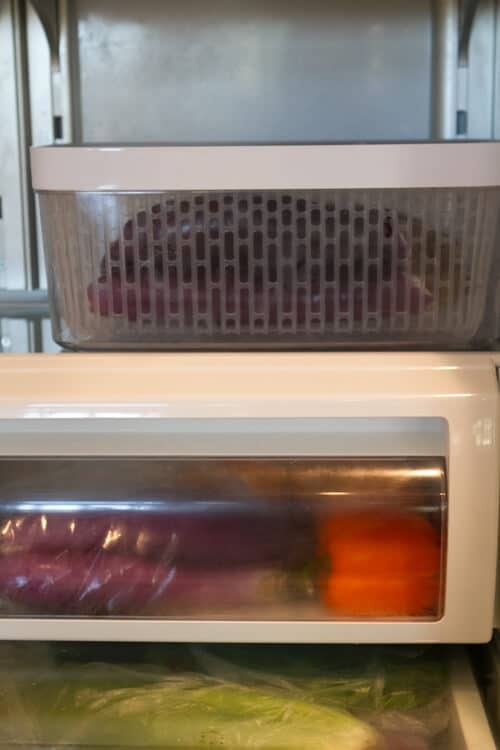 So when OXO reached out and asked if I’d like to test drive their new line Greensaver line of fruit and vegetable storage containers, I couldn’t say yes fast enough! Teaming up with Melissa’s Produce OXO sent me the 5 qrt produce keeper and Melissa’s sent some beautiful japanese eggplant to “test drive”. For 5 days!!! The one below it was stored in the plastic bag below it – and this photo was taken on day #3. I can’t show you day #5 because… well, let’s put it this way – it was “not” photogenic – at all. But the eggplants stored in the OXO Greensaver box? They were still going strong a couple of days later. So “yes” – these boxes really work and are the solution I’ve been looking for to extend the life of my produce!!! 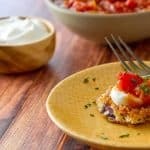 Now that I have a way to store eggplant (and other veggies) I’ll be making these Eggplant Fritters with Tomato Chutney more often! Dipped in an egg wash and coated with panko crumbs they are crispy on the outside and have an almost creamy texture on the inside. 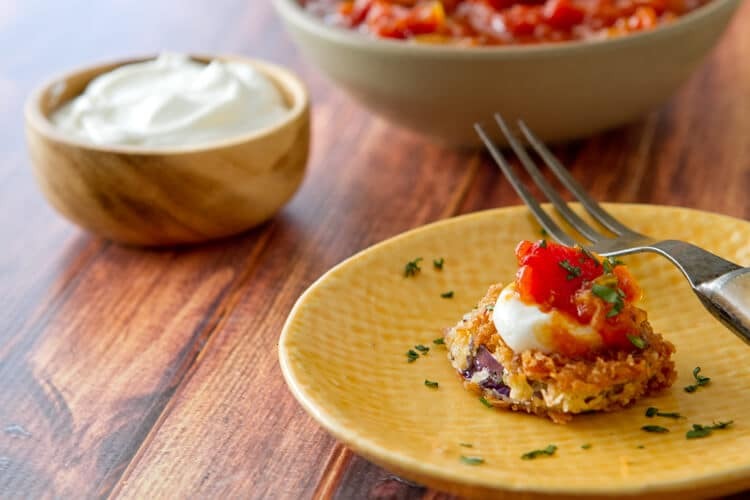 Topped with a little plain greek yogurt and my homemade tomato chutney, these eggplant fritters are a great appetizer or, paired with a large salad make an easy vegetarian dinner! 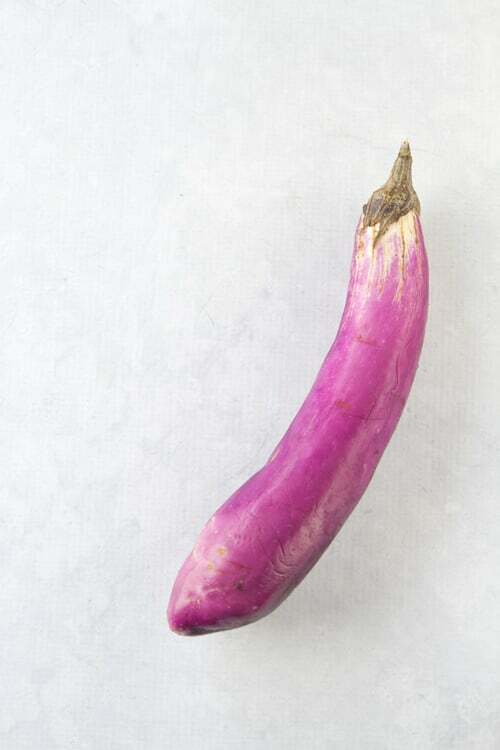 I was provided a sample of the OXO Greensaver box and with the japanese eggplant. As always, all opinions stated are my own! These Eggplant Fritters with Tomato Chutney are crunchy and creamy with just enough spice!! Dust eggplant slices with cornstarch, shaking off excess. 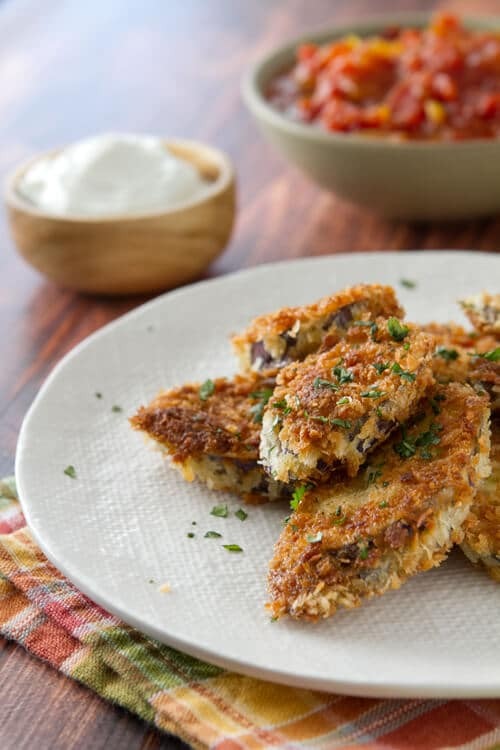 Dip eggplant slices into egg wash and then coat with panko crumbs. Heat oil over medium high heat in a medium skillet until oil shimmers. Test oil by dropping a few panko crumbs into oil. If they sizzle the oil is ready. Add a few eggplant slices at a time and fry until golden and crispy on the bottom. Turn over and cook until brown. Drain eggplant slices on sheet pan lined with paper towels. Season with salt and pepper. Serve with tomato chutney. 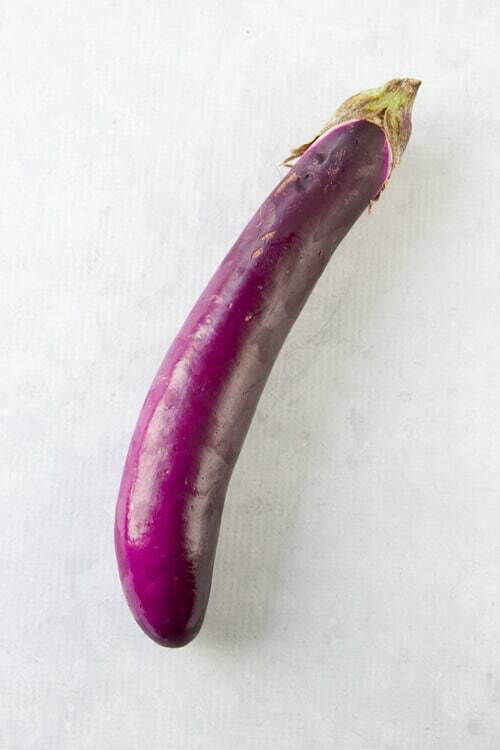 I’ve never been a big fan of egg plant, but your photos enticed me to give it a try. Surprisingly good with the chutney. I missed the star rating button, so this is the rest of my previous comment.